You may be wondering: what’s an IoT application doing on a golf course? Swing King went with Banyan Hills Technologies’ Canopy IoT platform to help scale operations. It’s a hot summer day in north Georgia and two employees of Swing King are digging a hole at a golf course overlooking Lake Lanier. Unlike the other holes on the course, this one will not be located on the putting green. Instead, this hole is being dug about 30 feet away from the green, underneath the shade of a tall oak tree, where it will be used to accommodate equipment for a new IoT application. Now you may be wondering: what’s an IoT application doing on a golf course? Swing King came into existence four years ago by putting a new, digital spin on an old game and the company execs knew they needed the help of an IoT software platform if they wanted to grow quickly. They chose Banyan Hills Technologies to help them scale the business. Once the hole on this north Georgia course is dug, it will hold a 12-foot tall pole with three high-definition cameras located at the top. Each camera will focus on different parts of the hole. Taken together, the cameras provide a comprehensive view all the way from the tee 150 yards in the distance to the nearby hole on the green. Why all the cameras? Well, Swing King operates a unique hole-in-one contest at more than 250 golf courses around the country and the company needs the video evidence to pay out winners. Also, the golfers love to share videos of their successful shots with all of their friends. Here’s how the contest works: if a golfer wants to take a chance on landing a hole-in-one, they can pay to sign up for the contest in the pro shop before their game or they can sign up with a Swing King representative if one happens to be on the course that day. Given the added fun the hole in one swing adds to the round of golf, some courses also include the hole in one swing as an amenity for all golfers who play their course. When the golfer comes to the hole with the cameras, the shot will be visually recorded and if there’s a hole-in-one, the golfer wins a prize. On some courses, the prize can be up to $100,000. Since its February 2015 inception, the company has paid out more than $500,000 in prizes to more than 100 people. In addition to the money, golfers receive the video of their hole-in-one that they can share with all their friends on social media. 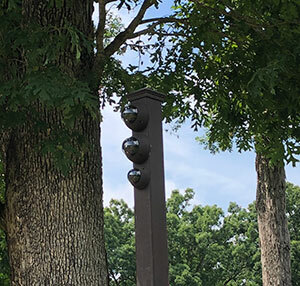 Each of three high-definition cameras on this pole will focus on a different part of the hole. Taken together, the cameras provide a comprehensive view all the way from the tee 150 yards in the distance to the nearby hole on the green. Canopy helps ensure that the unattended equipment is running properly. Instead of all that organizing, buying of insurance policies and having live witnesses, Swing King automated the contest and added Internet of Things technology from Banyan Hills Technologies to make it easier to monitor and scale the business. Hoersten has experience in scaling unattended retail businesses: he previously served as a senior vice president of technology at the Redbox DVD Rental kiosk business. During his tenure at Redbox, Hoersten oversaw the development of technology that helped the company grow to more than 45,000 kiosks and $2 billion in revenue. When Hoersten came to Swing King, he says he knew he needed a software solution that would be robust enough to scale. The Banyan Hills Technologies IoT platform, CanopyTM, has served as the backbone of the company’s operations for several years now. In particular, Hoersten says the software needs to be able to tell operators if the hardware stops working, if it’s “limping along” or if it’s not able to heal itself with a remote software update. There are other tools out there that can send a heartbeat to indicate that the machine is communicating but that only gets you so far, Hoersten says. In addition to monitoring the system to ensure it’s working, Swing King uses Banyan Hills Technologies’ software expertise and professional services to help facilitate PCI-compliant payments through tablet point-of-sale stations deployed at the golf courses. Hoersten says the reporting and analytics presented in the Canopy dashboards is something he views every day to monitor sales, revenue and operations at Swing King’s locations. The company often A/B tests different hardware configurations to see what pieces perform the best and Canopy’s reporting helps Hoersten decipher the outcomes of those tests. 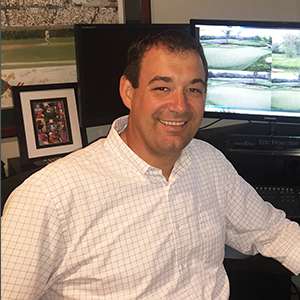 As a result of working with Banyan Hills Technologies, Swing King was able to increase the number of locations that could be managed by one person from 50 to 200 locations. Working with Banyan also helped Swing King with employee training since everything runs through one software platform – Canopy. This was done to prevent having to put every software function on a different system. Find out how an IoT platform like Canopy can help your unattended business scale.